They're sleeping now, but the first one to wake on Christmas morning will have the others up in seconds! The chaotic fun of those special times is captured in the 3 grandkids sleepy Christmas morning personalized Christmas ornament in cheerful colors and adorable design. 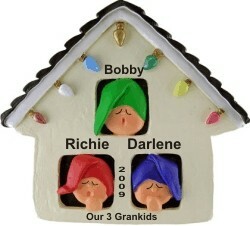 We letter by hand the names and details you provide for these grandparents ornaments that both kids and adults love. A display cord and our classic velvet gift pouch are extras you receive with the three grandkids on Christmas morning personalized ornament from Russell Rhodes.